I flew down to San Diego last Thursday to spend some time with Dana and participate in my second triathlon, the Jamba Juice Triathlon. Dana and I spent a few nights hanging out with friends, eating copious amounts of quality mexican food and, generally, having a good time. On Sunday, October 1st, Dana’s friend Felipe and I did the triathlon. I ended up 52nd out of 119 in my age division and 450th overall out of about 1,480 participants. Not too shabby for my second outing. My overall time was 1:06:30, which was 13 minutes faster, but the course was quite a bit different than the Kirkland triathlon. It was a slightly longer swim, but the bike was three miles shorter and didn’t include any of the Seattle hills I had to deal with in Kirkland. Next up is the half marathon this Saturday. I recently mentioned that I was going to be participating in my first triathlon. A sprint triathlon to be specific. 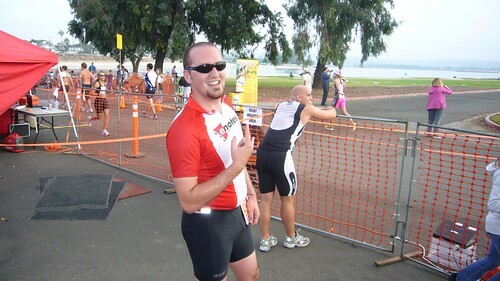 To be even more specific, I’ll be participating in the Kirkland Triathlon at Carillion Point. Since it’s my first triathlon I’m planning on doing the non-competitive version which I still find daunting. 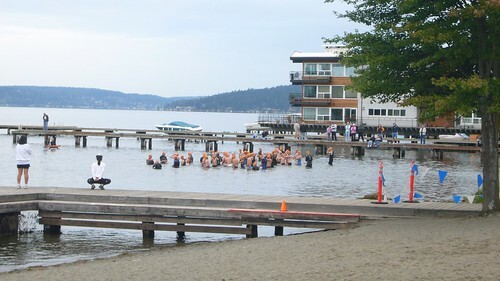 It starts with a 0.25 mile open water swim in Lake Washington followed by a 12 mile bike ride through the streets of Kirkland and finishes up with a 5k run. I’ve been following a fairly stringent training program. I haven’t been drinking during the week, I’ve been bricking events, etc. My normal training routes include 13 miles on the bike and a 2.8 mile run around Green Lake or a 2.6 mile run down Madison to Madison Park, a 500 meter open water swim and then 2.6 miles back up Madison, which is about 400 feet of elevation difference. 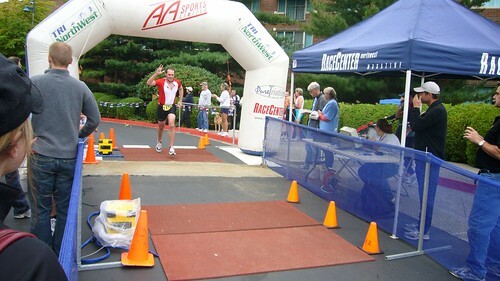 To gauge my training I ended up running the Lynnwood Hi-5 5k Fun Run. In early June I ran a 27:29 during my first 5k. During my second 5k a few weeks ago I ran a 23:44 and placed 12th out of a field of 77. Clearly, my training is going well. Well, it was going well until about 1.5 weeks ago when condo projects and, in general, life started to get into the way. Recent attempts were foiled by a lack of a bike lock one day and a popped bike tire the next day. The condo projects have really put a damper on my back and my legs aren’t in great shape, but I’m resting for the rest of the weekend. Overall, I’m a bit worried and really excited to compete in this race. It’s by far one of the most challenging physical tests I’ve ever put myself through. At the very least, I’ll complete it. I’m currently hoping to finish in 1:45:00. I shall post pictures and a followup on Monday if I don’t die. John, Carly and I took to the streets again today on our bikes. Our goal was the south loop around Lake Washington, which is about 40 miles. Due to some detours by our fearless navigator, John, it stretched into 43 miles. Amazingly, I’m not dead. I’m extremely tired, but the ride felt fine. The last hill up Eastlake and 10th almost killed me, but I managed and topped of the day with Kay at a local swimming pool. I need to get a camera so I can start taking pictures on my bike rides. Some additionally interesting facts are that it was 85+ degrees the entire ride, I drank three liters of water (and didn’t pee, which means I sweated three liters of water) and it took us about 3.5 hours I believe.